My promise of releasing a new version on january was a little far-fetched but no worries, I am still working on this. Development slowed down to a crawl these last months because of some poor desisions I made regarding the mod. But rest assured that I had more than enough time to clear my head and the mod is still going. Next version, I'm afraid, won't have the sprites pack ready, but I did fix some bugs, improved on the particle effects and I will add the remaining weapons. Awesome, you're back! I'd grown concerned. Have you ever considered adding the missing monsters in working condition inside a separate document,like you dont need to add them to the wad,but at least leaves some datas for if someone ever wanted to use them. I wonder wich of the bosses we could use to replace Icon of Sin. Also i tried the zombie patch and it doesnt work,they still get back up. Yes, I have an expansion pack planned for this mod after I reach a more stable version(probably next version actually). I want to add the remaining mosters and powerups aswell as the stuff from the Shrak and maybe Malice TC for Quake. And also, I tried to replace the Icon of Sin with Shub Niggurath, but so far, it's model gets all screwed up on conversion, so I'm working on that. Ed the Bat wrote: Awesome, you're back! I'd grown concerned. Yeah,keep up the good work,i like to use this mod as an alternative for Quake 1,until i find myself the full PC version. And if everything go right who know what the future might bring to us with this mod. Im sorry, but where is Super-NailGun and RocketLauncher? Some weapons have randomized spawns. Super-nailgun has a 1/3 chance of spawning from in place of chainguns. Rocket launchers have a 2/5 chance of spawning from regular rocket launchers spawns. Once again, sorry for the lack of updates. I'm just not used to forum etiquette at all(specially when it comes to projects and stuff). I'll do my best to keep everyone updated from now on. Also, something regarding the dreaded sprite patch. I was doing the unthinkable and making the sprites ludicrously big, full 8 direction rotations, and with the exact number of frames from the models. I'm not sure what I was thinking, but needless to say, it the file size was HUGE(hence that poll), it became a chore working on that, and it was just all around impratical. So I decided to scratch the whole thing and start over. I won't give up on that idea because I myself am a software mode junkie . It won't be a patch anymore though, it will be more of a fork of the main project. 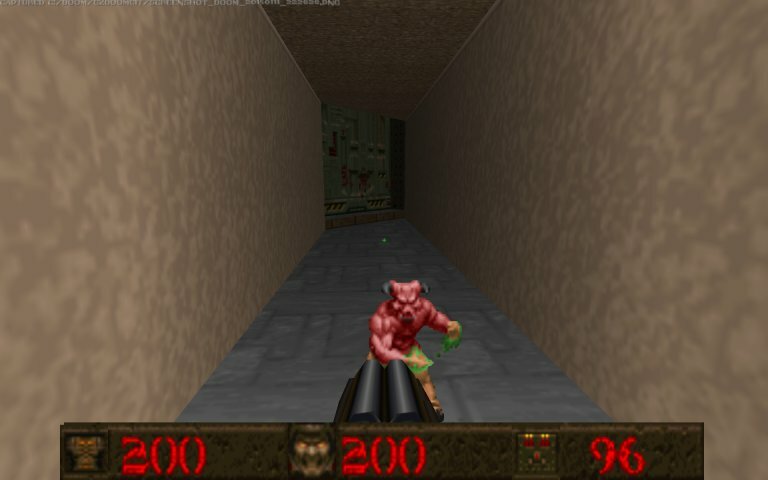 Sprites will follow what I like to call "Build engine standards"(around 80 pixels high, 6 walking frames, etc...), this way the sprites will be higher-res than Qdoom's, but still have a reasonable file size. The gigantic sprites I ripped previosly will be posted on the projects forum when I have the time(because why not?). I am extremely busy right now, but once november ends, I'll have plenty of time to nail the last 3 items on the list and finally finish this version. I won't give an exact date of release, but stay tuned. Good news! I thought the project is dead! After one brutal year in development, it's finally here. Enjoy. I see a concern about the gremlin causing a crash? I'd help investigate, if you can give some more details. What circumstances do you see it happen? I'm not seeing it happen yet (tested so far only with Grunt and Rottweiler corpses). I'm seeing a major hiccup with the animations from firing the Super Nailgun. And I'm finding that the grenade will sometimes silently explode when it finishes bouncing, instead of coming to a stop to tick down like usual. Mainly happens when I shoot it so it lands near a wall. Also, I presume this is a typo, because I got a startup warning for MODELDEF.txt about the string "INTERPOLATEDOUBLEFRAMES"
Ed the Bat wrote: Also, I presume this is a typo, because I got a startup warning for MODELDEF.txt about the string "INTERPOLATEDOUBLEFRAMES"
The flag is INTERPOLATEDOUBLEDFRAMES I think. Indeed that is what it should be, as the Wiki attests. I also noticed that fiends and death knights (maybe others?) can jump down from ledges where their Doom equivalents wouldn't. 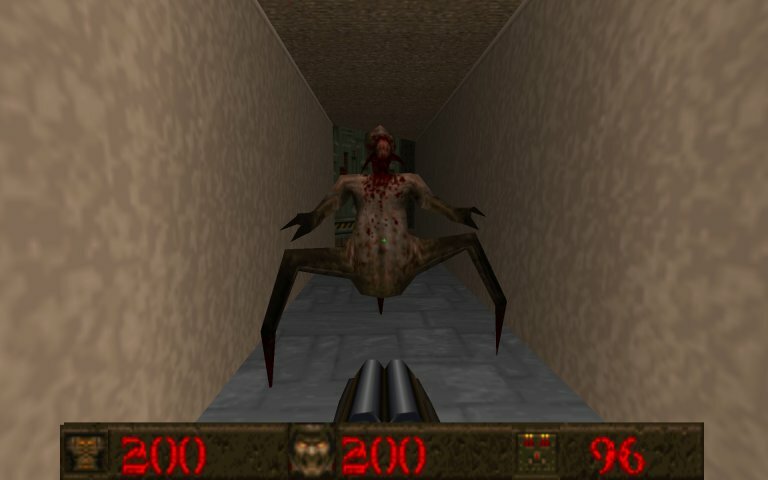 In some maps (Doom2 map29 for example) this meant a lot of enemies jumping off of ledges and then wandering around harmlessly in the blood lake below me as I took the high road. Just tried the new version, bravo! The mod keeps growing amazing. However, i have a complaint on the shotgun: Its refire is too fast, it should be slown down a bit.